Thank you for your interest in becoming a part of the Chemo Duck family. Chemo Duck is a cuddly pal that will provide your child with the huggable hope he or she deserves during their treatment. 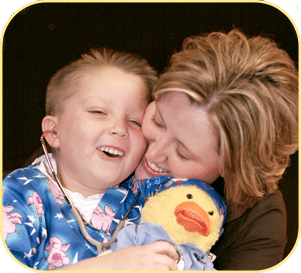 It is through the power of play therapy and Chemo Duck’s companionship that your child will find comfort during their experience with cancer. To assist parents and caregivers, we have developed a variety of tools to help organize your life and to hopefully provide some comfort during this difficult time. Our hope is that these tools will help you cope, communicate and navigate through your role as a parent or caregiver of a child dealing with cancer. Download our Parent-to-Parent Guide for knowledge and insight into creating your own pathway to living with childhood cancer. Join us on Facebook and Twitter to share stories, emotions and experiences with others in the Chemo Duck community. Watch our video. This video is also included with Chemo Duck orders. It will help familiarize you, your child and your family with the Chemo Duck Program. Chemo Duck can help your entire family! Don’t forget to also take Chemo Duck to all of your child’s hospital and doctor visits so he can become an integral part of your medical team.